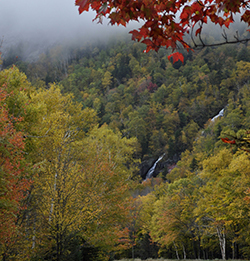 Renowned for its beauty, Maine is a favorite destination of hikers throughout the world. Maine is equally known for hosting the most arduous section of the Appalachian Trail (AT), which culminates on Mt. Katahdin. Our Park Search Feature lets you mix and match activities with park facilities. Hiking with your dog? Please read about Pets in the Parks. Bradbury Mountain State Park - your children can “bag” their first peak here by hiking to the top of Bradbury Mountain for a picnic and expansive eastward view from the granite capped peak. The hike to the summit is -mile a steep short 10-15 minutes for adults. With children plan on several rest and nature observation stops. A playground and picnic area is available near the start of the trail. Campsites available. Mount Blue State Park - offers a looping trail, swimming, picnicking and a playground near Webb Lake. More adventurous trails lead away from the beach and are offered on Center Hill. For a more backcountry experience visit the adjoining Tumbledown Public Lands. Campsites available. Peaks-Kenny State Park - woodland trails, a sand beach along Sebec Lake, and a playground make this a fun family destination. Campsites available. Wolfe’s Neck Woods State Park several easy walking trails skirt the shoreline and provide an opportunity to view nesting osprey, woodland exploration, and ample benches and picnic spots. Beach Walking sand beaches check the tides before you go. Crescent Beach State Park - a classic saltwater beach. Ferry Beach State Park also offers pond, bog walk and forest walks, famed tupelo trees and a nature center. Fort Popham State Historic Site take in a beach walk and a fort visit. Reid State Park offers both sand beach and rocky shoreline. Scarborough Beach State Park a very popular swimming and sunning location. Bradbury Mountain State Park annual Hawk Watch and Feathers over Freeport. Cobscook Bay State Park a favorite birding spot as more than 200 bird species frequent this bay. Wolfe’s Neck Woods State Park annual Osprey Viewing and Feathers over Freeport. Maine Trail Finder maps and a searchable database of trails throughout Maine. Baxter State Park Home of Mt. Katahdin and the terminus of the AT. Hiking and Climbing a link to Maine Office of Tourism pages. East Coast Greenway information about the nearly 3,000 miles of trail in development between Canada and Key West, FLA.
Maine Appalachian Trail Club includes online maps and resources. 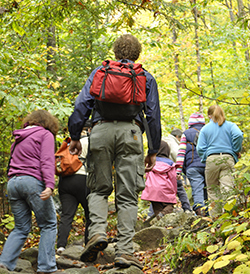 Appalachian Trail Conservancy includes hiking information and an interactive map. First Aid basic supplies include band aids, moleskin, 4x4 pads and first aid tape. Check with your local American Red Cross for first aid kit tips and classes. Carry plenty of water, sun screen and a snack. Be prepared for bugs and ticks. View a tick ID wallet card at the Maine Center or Disease Control and Prevention. Call them to get a copy with e tick removal spoon.